The Kingdom Hearts 10th Anniversary Box. 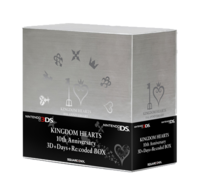 The Kingdom Hearts 10th Anniversary Box is a compilation bundle created to celebrate the ten year anniversary of the Kingdom Hearts series. It was released on March 29, 2012 in Japan. Pre-orders are limited to one per Square Enix member. Special box with 10th Anniversary design. This page was last edited on 7 September 2018, at 01:05.